I've been using ThaiPod101 since 2011. Fast-forward to 2018, and it's still very much a core tool at the heart of my ability to speak this wonderful language. I update this review yearly to reflect newly added features and changes in the format of the program, so that you can get a deep insight as to what to expect. You'll notice that I promote this program around my blog as my recommended go-to learn Thai resource. The reason for that is that it's simply the best there is. 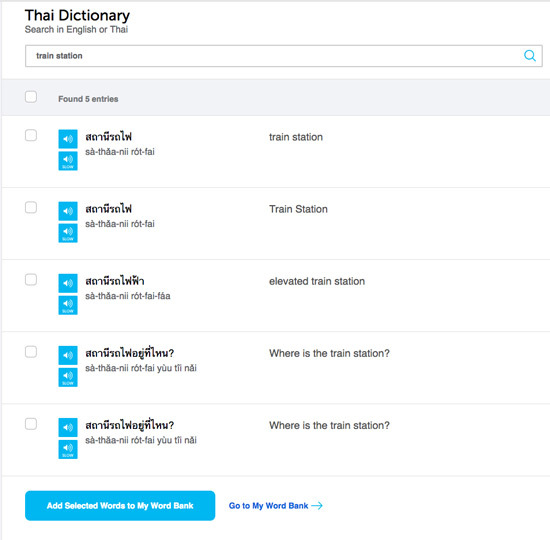 The platform keeps being improved, year-on-year, and has everything required to take you from beginner phrases to conversational Thai. In this review, I'll give you a comprehensive overview of what to expect from the tools and materials provided with your free account, and those you'll get when you take up a paid subscription. Initially, I started using the program to get ahead of my fellow students at Thai school, but what with work commitments pulling me away from classes, I ended up leaving school for a while and studying solely with ThaiPod101 in breaks, journeys and on weekends. 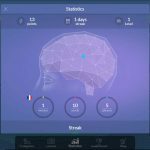 When comparing my progress at school with the program, I found I learned faster with ThaiPod101. I think the reason for this was because with the program I could study as and when I wanted, while in the evening school classes I was often too tired to really focus on what the teacher was saying. You see, there's a point in the day when my brain just stops responding well and won't soak up the learning. 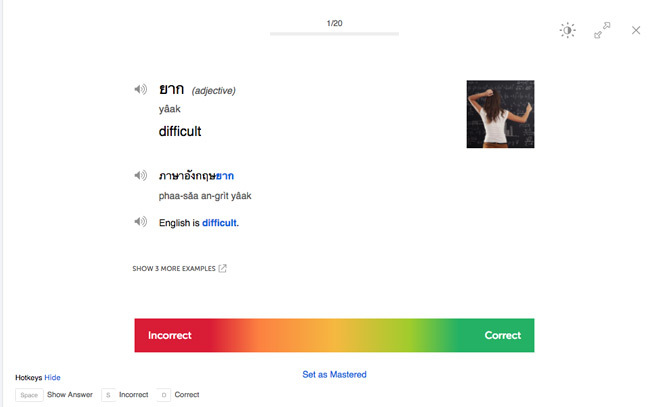 Trying to learn Thai after a mentally challenging day working can be tough. That being said, I did go back to school because I enjoyed the social interaction of the classroom and meeting new people. I met a couple of great friends there whom I have stayed in touch with. I'm not really a fan of learning out of textbooks. I prefer interactive methods over repeating things to myself in parrot-fashion. I guess this is why I struggled to do my homework outside of class, yet excelled inside the class during group-learning exercises. When something is fun, you naturally get into it more. ThaiPod101 is exactly that; fun and interactive. If you're starting out as a beginner, this is one of the basic lessons you can begin with. As you can see you can view the dialogue Thai, in English, or as a romanisation (the English version the Thai words). The program avoids the repetitive school-like learning process by providing you with a diverse range of interactive materials and tools. New lessons are released every week, which keeps you motivated to get past your current level and learn new stuff. at the basic level you will learn single words, common phrases, and basic conversational interaction. You will pick up a lot of words very quickly, and then as you take the lessons you will begin to see how those words fit together. Intermediate level steps things up with deeper conversations on topics that are more difficult and may involve describing objects or situations. You'll also learn to express opinions and understand those of others. The program is mobile friendly and has an app, which you will be given when you sign up on the website. This interactive, mobile-friendly learning is ideal for me because I have a Tablet and a Smartphone, which means I can learn on the go: on the BTS, on planes, in hotels, in bed on a Sunday morning…you get the picture. There are so many useful lessons that focus on every day interaction. The program can take you from beginner right up to intermediate/advanced level. Lessons are grouped into five levels: Introduction, Absolute Beginner, Beginner, Intermediate, and Advanced. Under these five levels, the lessons are further grouped into series, with more specific levels. Under each series are different seasons, which are lessons grouped into sets of 25. At the end of each lesson, you'll be given an oral quiz to improve your speaking ability and a chance to see how you are progressing. 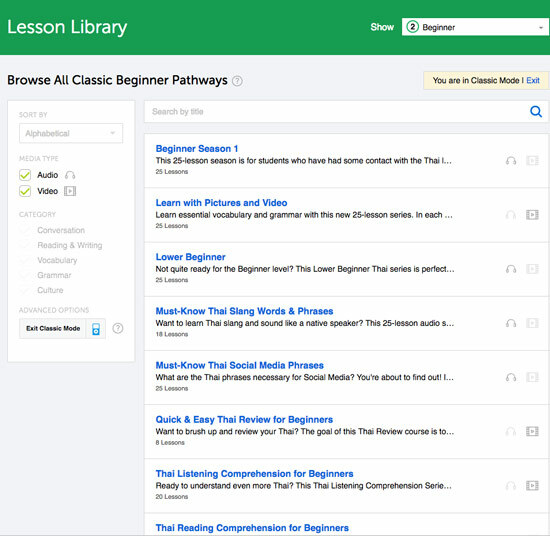 Of course, you can go back and re-study any of the lessons, and use the learning tools at any time you wish. Even though my Thai has progressed a hell of a lot since I started with this program, I still use the lessons as refreshers. 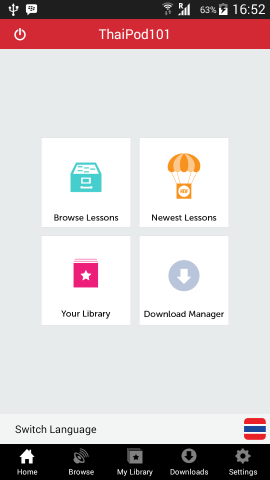 One cool feature is that you can favourite lessons, so when you want to go back and retake those lessons you can just click on your favourites tab. I often find myself listening to old phrases, just to rejig my memory on words I've neglected using. I don't have the best memory retention, so re-caps are essential for me. This to me is the most useful thing about having a program like this, and the biggest advantage over a school – because it's really handy to be able to go back over things you've learned at the touch of a button. There is a big catalogue of lessons to get started with. In this image you can see a handful of lessons that includes useful everyday slang words and phrases, even social media phrases! Some lessons have pictures and videos too. Thaipod101 Learning Resources- What's in the Box? *Remember that a basic account is free, so you can take advantage of the basic resources immediately. The flashcard section is another interactive way to learn and test yourself. First you are shown the image and the English, and then you have to give the Thai equivalent. The first 100 or so Thai words you learn will become your grounding. 100 words sounds like a lot, but you'll be very surprised how quickly you pick up words once you start. From there, you can use these words to piece together sentences and start small conversations. It's a great feeling to talk to people in Thai, and really opens up a new Thailand that others who don't speak Thai don't get to experience. 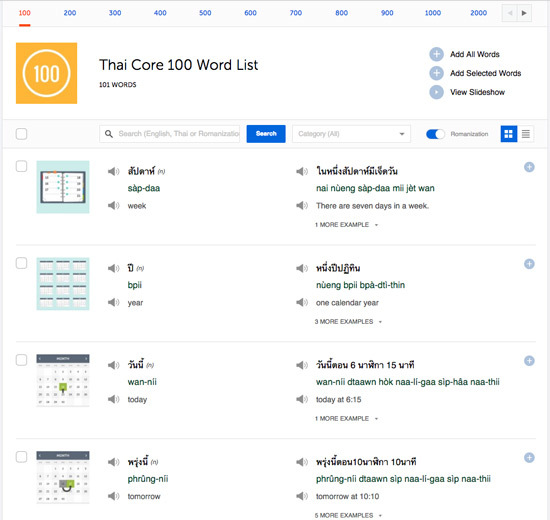 Thaipod101 has word lists that range from 100 – 2000 words long. These are great fun when you want to quickly dip in and learn a few new words. But they're not just lists, they also give you an example of contextual usage for every word. With these lists alone, you'll learn those 200 words in no time. 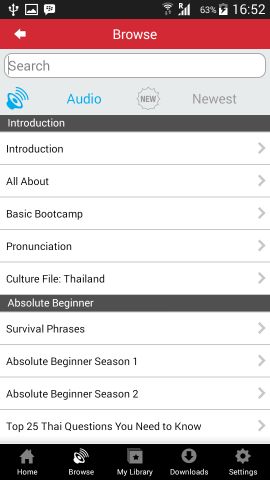 This program has so many features, and that's what makes it the best program out there for learning Thai. As a beginner, the thing that you will appreciate most about this program is the romanisation of the Thai words. This enables you to see what the words sound like in English and will help with your pronunciation. However, I do recommend that you practice writing the Thai letters too, which can be done under the resources section where they have a Thai alphabet table. Once you learn a word, have a pencil and pad beside you and practice writing out the word. You will never be short of learning. 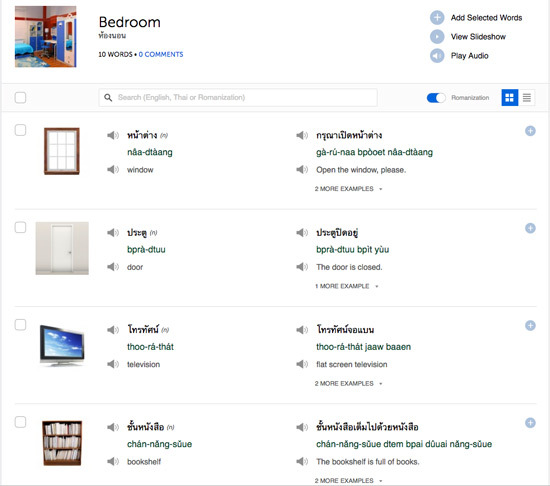 You can use the lessons, the flashcards, word lists, quizzes, the keyword list, they even have a fantastic Thai dictionary for you to look up words at any time and have them translated into Thai. This is a really good dictionary that makes it very simple to look up words very quickly. One thing I like about it is, as you can see from the example, it gives you other possible variations of the word you are looking for. Once you have signed up for an account, you will be given access to the app, which you can use on your phone. I don't really see the point of using the app on a tablet because the desktop version works very well on the iPad, for example. I prefer learning on the desktop version via my computer or my iPad, but the app is useful for when travelling, or when you are bored and having to wait for an appointment somewhere. Nice easy home screen helps you navigate to the tools you need. 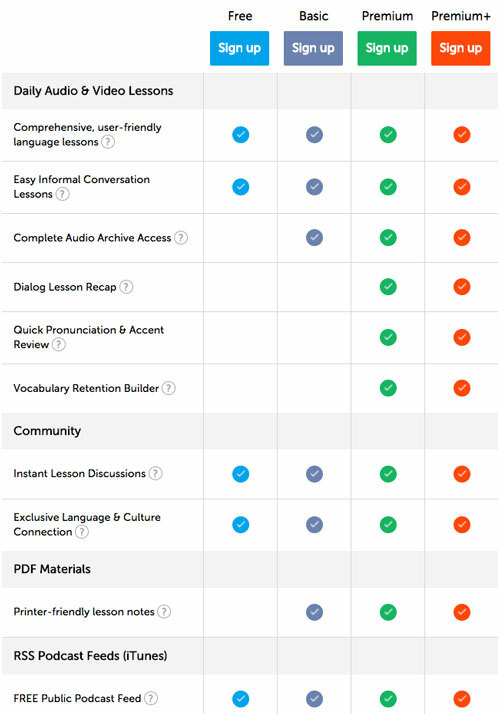 For each audio lesson, you'll see these options. Notice that you even get PDF lesson notes that you can download. Here you can dive straight into useful phrases. On this page you listen to the audio and are given the Thai and English scripts. Expansion digs down into the audio conversation you are listening to and gives an in-depth learning experience. 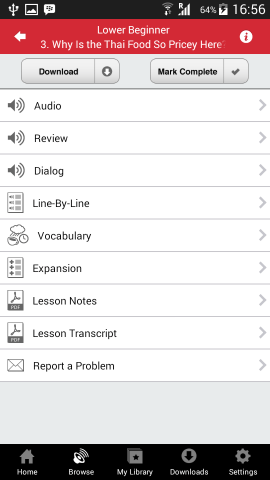 Line-by-line audio learning lets you swap between the Thai, the romanization and the English alphabet. Just keep clicking play to go back over and try again. As mentioned previously, there's a free membership option that gives you access to some basic language and cultural learning lessons. Outside of that there's Basic, Premium, and Premium+. For the first year I had a Premium+ membership, which costs $47 a month. In GBP this works out at like £33 quid a month. However, I paid for 24 months, so I got 50% discount. The Premium+ gives you a personalised curriculum, 1-0n-1 instruction, and professional tutor assessment. I strongly advise that you pay for 6-months+ up front, because otherwise you pay full price and miss out on a big saving. I've since downgraded to a Premium 2 year subscription, purely because my Thai is getting pretty good and I'm at a stage where I learn mostly through daily conversation with my wife and friends. If you don't have the budget to go Premium+, then Premium is good enough. 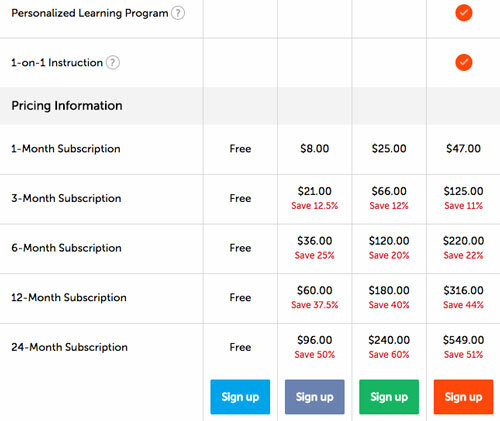 If you are on a real shoe string budget but still want to crack on with learning Thai, then grab the basic membership at $8 a month (or $60 a year); it's still awesome value. It's also worth noting that there's a money back guarantee with your purchase, and you can cancel your subscription at any time. Whatever plan you choose, consider this: I was paying around $1,200 per year for my Thai school lessons. My Thaipod membership is less than a quarter of that! And I can learn at my own pace, using a variety of multimedia from my phone, iPad or computer. Believe me, being a tight-fisted Englishman (hehe), I've done the math. Even if I get a study visa for a language school in BKK for 24,000 Baht (per year), I still save over $600 learning from home with this program. Of course, if you have the money, you can still go to school, but in my experience, the confines of those school walls can hold you back. My advice is learn on the go, and get out into the real world to speak with locals and learn from friends. Because many of the school curriculums are outdated. It's rote learning, with not enough emphasis on colloquial (everyday) Thai. I'll never forget coming home and trying to ask my girlfriend (now wife) whether she'd seen a rainbow before. She almost wet herself laughing! “Why don't they teach you something useful”, she said. Don't get me wrong, I met some cool people at school and I loved the teachers (blush), but it's a fairly rigid way of learning Thai. School is good for study-discipline and banging those words you keep forgetting into your head, but a program like Thaipod101 makes the learning process diverse, fun, flexible and personalised. Oh, and cheaper! Do both if you can, but if I had to do one I'd choose to learn in my own time, my way, at my own pace. Either way, however you learn, get out there and start speaking Thai with Thai people – that's the fastest way to advance. 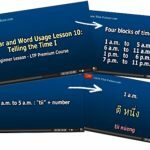 ThaiPod101.com makes learning Thai fun and easy to fit in around your lifestyle, meaning you don’t have to commit to classroom times or schedule one-on-one lessons with a teacher. It ‘s very affordable, and the amount of existing and newly added content available keeps things interesting and progressive. The creators think outside the box, giving you useful colloquial Thai not often found in school textbooks, and in that respect I think this program is streets ahead of any other learning resource on the market. Thaipod101 has been a major contributor to achieving my current conversational Thai ability. Whether you're an absolute beginner, or you've been learning ad-hoc from phrasebooks and/or your Thai partner, you'll enjoy making rapid progress with this program. Thanks for your review. I started learnng Thai just shortly, mainly to be able to conversate. I'll take a few Skype-lessons with a personal teacher to see if that works for me, but I didn't see the premium membership on Thaipod 101 before.It says, you have a personal trainer. But how personal is this. I get the idea, you do your homework, send it in digitally and get responsive after review from a Thai teacher. But never have real contact. Am I right about that? Ha. I wouldn't worry too much about that. Thais understand how difficult the tones are for foreign speakers. Most are pleased that you are making an attempt to learn the language. Like TTL says, don't worry about it. I can't do tones well (or at all if you ask my partner...) but I've found that with practice I'm getting a bit better (or not improving at all if you ask my partner...). You'll find all these tone practice exercises which are basically worthless because for a lot of them you're being asked to 1) say words that don't exist (although the new wood doesn't burn... tongue-twister is an exception) and 2) emphasize the tone which is unhelpful as the tones are (mostly) very subtle in conversation. It's kind of like the subtle difference between "they're" and "their" in English. Even if you say them identically people will get what you mean from the context.So, did the laughing people think you were calling him "him" or "rice" or "mountain" or ??? Well, I just bit the bullet and got a Premium subscription to TP101. They're running a 6-month special right now (45% off in the US) so I thought I'd give it a try. I have been using Learn Thai Podcast but have grown a bit frustrated with not having a feedback mechanism to see how I was doing. 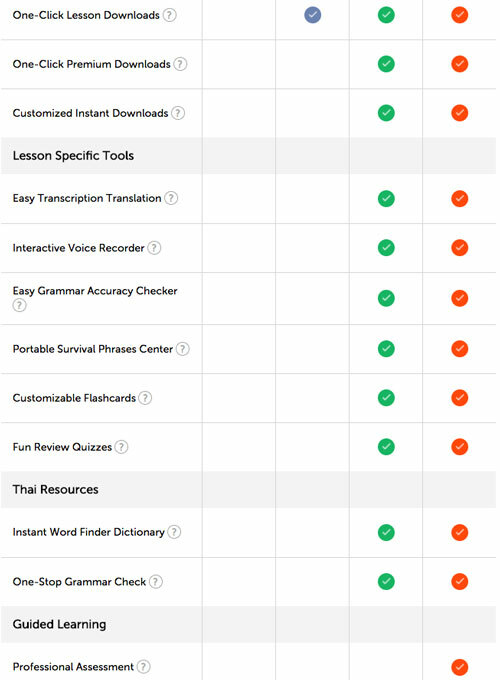 TP101 has both an audio comparison tool and quizzes for each lesson (which is a really sneaky way of getting you reading). Looking forward to improving as I had been feeling a bit stagnated. Thanks for this review. I'm up and running with a Thaipod account now and really enjoying it. I even said a few words to my partner in Thai, and she understood me! Hi John, I have one here: https://www.thethailandlife.com/learn-thai-podcast-review . Cheers! Hi John,I thought I posted this the other day but apparently something went wrong.LTP does have a set of free lessons to give you an idea of their setup. It's at: https://learn-thai-podcast.com/blog/free-thai-language-lessons-for-your-holiday/Hope that helps in your decision making. Hey Nick, I'm in the process of reviewing the Thai Pod Cast, so you'll have to wait on that one for a bit I'm afraid. ThaiPod is excellent though and has got better since the app updates. Glad you're enjoying too! what kind of thai does this program teach? I heard there's a few different dialects but I want to learn the most popular one. Hi Carly, Thaipod teaches central Thai, which is spoken by even those in the South, North and North East who speak their own dialects too. Central Thai is the dialect everyone who learns Thai studies first. Let me know if you have any further questions. Thanks for the heads up on this. I registered for the free membership and it's pretty fun.How much more value do you get with a paid membership? Hey Ian, you get heaps more, as you can imagine. The free membership is cool at a basic level, but when you upgrade it unlocks access to lots of videos, lessons, quizzes and all sorts of interactive learning material, including an app. Well worth it.All the best with your learning. I learn thai language by my self at home. So i hope that thaiPod101 can help me. Thank you before. Hi Mai, it's a great program. Make sure you sign up through one of my links in the post to get your free account and your discount if you decide to take a plan. Be sure to check out my free Thai lessons too. Just go to the menu at the top of the page where it says "Learn Thai". All the best!